The Karamojong are a tribe of fierce warrior pastoralists found in the north eastern corner of Uganda bordering southern Sudan and Kenya. A region that is relatively unvisited. There are Karamojong villages (Manyattas) located near Kidepo valley national park and a Manyatta is one destination that you could add to your itinerary for that Uganda safari you are planning. Here you will meet the karamojongs, a proud and fierce group of semi nomadic pastoralists with a rich cultural heritage. This region including the Kidepo valley national park are so rarely visited, and not many know about the Karamojongs or the park, which is such a contrast to their cousins the Masai in Kenya who are featured in numerous magazines and stories and documentaries. The average visitor to Uganda knows very little if anything about the existence of the Karamojong people. 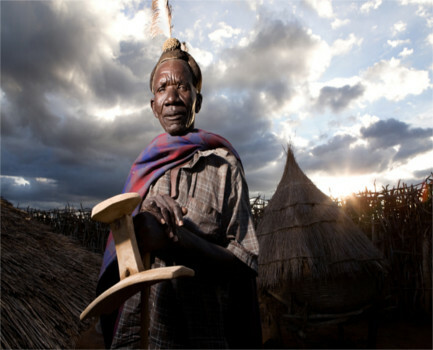 The Karamojong have lived in the North Eastern region of Uganda for hundreds and hundreds of years. During colonial times the British colonial governments failed to control this tribe of people and their area was simply set off limits. Religion: Unlike the rest of Uganda where most of the people have adopted a foreign religion either Christianity or Islam, the Karamojong still follow their traditional religion and believe in a god –Akuj. Why were the Karamojong hard to control and the area set off- limits? They (the Karamojong) believed and many still believe that all the cattle in their known world or their area of existence was given to them by their god AKUJ, and that the cattle of the neighbouring tribes was also theirs. This belief is probably the root of years and years of tribal wars and cattle rustling, because the neighbouring tribes have the same belief about themselves- that the cattle were given to them. During Idi Amin’s regime, there was an increase in violence in the region mostly due to the increase in supply of weaponry especially guns. The government has been gradually disarming the Karamojongs of their weapons in a bid to restore peace to the region and civil stability. The Karamojong consider cattle royalty and it is the measure of a man. A man is valued according to how many cattle he has. These people live for their cattle. They will do everything they possibly can to find good pasture and water for their cattle which is a difficult task considering the fact that the Karamoja region of Uganda is a very dry region. Who tends to the cattle? Roles for the Karamojongs are quite simply defined. While the men go out to find pasture and water for the cattle, the women stay back in the Manyatta to take care of the homestead and the children and both women and children tend the gardens to supplement their diet. Life in Karamoja is communal. Things are done together and for the good of the entire community not just a nuclear family or an individual. Men can take as many wives as they want to as long as they have the dowry to pay for them. It is one of those societies where dowry is still taken very seriously. 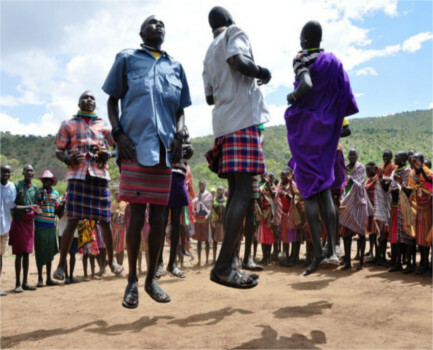 How are Karamojong communities structured? The Karamojongs are grouped by clans and by territorial sub groups which are the Bokora, the Pian, and the Matheniko. These clans often raid each other’s cattle but due to government intervention and confiscation of their guns, there are fewer raids today. Their communities follow the guidance of the elders and things are done according to democratic lines. How would you describe the Karamoja region? If you have watched some western movies, the Karamoja region is like the wild west of Uganda. It is pretty much unspoiled and unvisited African wilderness, but there is some gradual development happening. Road improvements have made access to the area easier, and there are chartered flights to Kidepo which make the park more accessible to tourists. Why visit a Karamojong Manyatta? The Karamojong Manyattas are interesting to visit because they are one of a kind. You will not find one anywhere else in Uganda. A visit to a Manyatta can be very educational and enlightening. There is such a rich culture in these villages that has been preserved over the centuries and has not been eroded by civilization. It is refreshing to see something so pure still exists. Visiting a Manyatta is a unique experience everything from the structure of the village, the homesteads, to the people and the language, all gives you a sense of community and togetherness. Scarcely dressed children will greet you in a very welcoming manner as you enter the village and you will see old men reclining on headrest stools wrapped in tunics, sharing tales of old to the young and old, about the traditions and ways of their people, or simply observing the goings on in the village. You mind have to get on all fours to enter some homes if you are invited in. Invites into their homes are a real privilege. The interior of their homes is mostly smeared with dung and mud, and they do not have beds and much furniture but the little they have, they are proud of and do not take for granted. These people live in complete harmony with nature, they do not dress up much, they are usually half naked and decorated in tribal markings. The weather and nature in Karamoja is harsh, but they still dwell harmoniously with it. Let’s not forget the cultural dances and the singing, a visit to a Manyatta is not complete without music and dance, do join in and jump as high as you can to the music. Because it is scorching hot, especially in the dry season, remember to carry a wide brimmed hat and some sun glasses for protection. Jeans instead of shorts are a better not only because it it is more culturally acceptable in the villages but also because you will need the protection from the thorn bushes. All in all a Manyatta visit is a worthwhile trip to make during your Uganda safari. 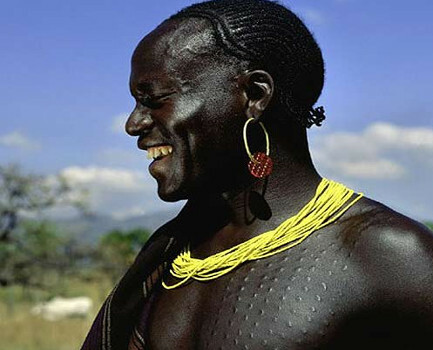 Discover and learn more about the Karamojong people. You can plan it together with a visit to Kidepo valley national park-one of the best game parks in Africa.